Temple University president Richard Englert (center) is escorted out of the auditorium after members of the audience shouted protests. Temple held its first public forum on March 6, 2018, on the construction of a football stadium. Protesters shut down a Temple University town hall meeting called to discuss plans for a controversial football stadium within 10 minutes of its start Tuesday. Community members for months had asked Temple to hold a public forum to hear from residents upset about the proposal and to answer questions about what was in it for the community. Temple planned to have president Richard Englert speak, then let architects present stadium schematics to the crowd, and end with a question-and-answer session. Instead, the evening was taken over by those in opposition, whose frustrations drowned out any hope of dialogue. Members of the audience, including Phil Gregory, shouted at Temple University president Richard Englert until he left the auditorium. "What we witnessed tonight is what we've experienced over the last two years," the Rev. William Moore, who opposes the stadium but tried to calm the crowd, said after the failed meeting. "People are frustrated because they feel their voices are not heard nor respected, and this is what we got." Englert had gotten about one page into his five pages of prepared remarks when he said that no one would be displaced by the stadium project, a major concern of residents in the North Philadelphia neighborhood that has watched Temple's footprint expand. A few audience members yelled out, "Liar!" and then a group of more than 100 people started chanting: "No new stadium. No new stadium!" Englert was then escorted out by security. Moore, a member of the Stadium Stompers, a residents' group that opposes the plan, got on stage to encourage the crowd of hecklers to listen to the presentation. "We don't want to keep going backward and forward, we're not going to make any progress behaving like this," he told the crowd. Englert returned briefly to say Temple would use the stadium for community activities, including youth sports. He also said the school would build an early learning and mental health center at 13th and Diamond Streets and a Laborers Union training facility in the area, and make a "substantial" investment in Amos Recreation Center. When he briefly went off script to say, "I understand we need to do a better job of listening to our neighbors," the crowd erupted again in jeers and the meeting was canceled. "I was disappointed," Englert said after the meeting, "but we're going to continue talking to our neighbors. A university by its very nature invites and thrives on difference of opinion. We're used to talking back and forth, but usually in a very courteous fashion." Temple has said a stadium would let it avoid paying costly rent for Lincoln Financial Field and boost the school's football profile. Neighbors have said a stadium will encroach on an already underserved residential area and worsen problems with trash, student behavior, and noise. The plan also calls for the closure of 15th Street between Montgomery Avenue and Norris Street. Temple said it considered community concerns in the schematics for the $130 million multi-purpose facility. The facility, to be built between Broad and 16th Streets from Montgomery to Norris, would include classroom and retail spaces. The stadium would not rise above the roofs of rowhouses surrounding it. Temple said a special stadium services district, to be privately funded, could be created to keep the area safe and clean. Fred Tooks, a North Philadelphia resident, said he was hoping to ask a question about that at the canceled event. "Why not negotiate with the Eagles? We just won a Super Bowl, there's got to be a better deal out there that doesn't involve tearing the community apart like we saw tonight," Tooks said. 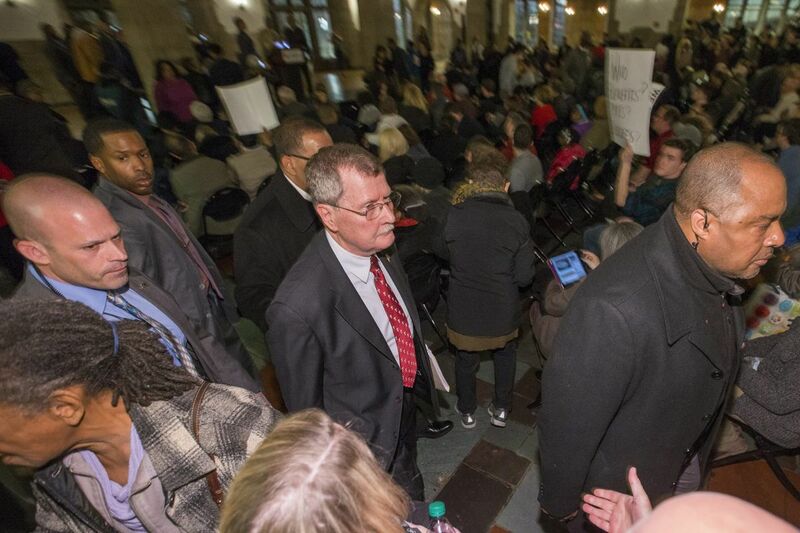 Passions were running high before the meeting as protesters shouted through megaphones and more than 100 entered Mitten Hall holding up signs that read, "We Shall Not Be Moved." Several were upset that no administrators from the university had attended a meeting that the Stadium Stompers held last week, when more than 400 community members, clergy, students and faculty filled the auditorium at Carver Engineering and Science high school for a rally against the proposal. "We love football, but we're calling a timeout for people being stepped over, stepped around, pushed out," the Rev. Jay Broadnax, president of Black Clergy of Philadelphia and Vicinity, told a standing-room-only crowd. Black Clergy of Philadelphia and Vicinity, the Philadelphia NAACP, and the Stadium Stompers held a meeting Thursday to discuss opposition to Temple University’s football stadium. "This is not just a North Philly fight," said Gail Loney, a resident and member of the Stadium Stompers, at the meeting on Thursday. "This is not just a Philadelphia fight. This is a nationwide fight for all people of color." Elected officials were largely absent from both meetings. At Thursday's meeting, three chairs sat empty on stage, saved for City Council President Darrell L. Clarke, whose district includes the North Philadelphia neighborhood, Englert, and Temple board chairman Patrick O'Connor. Chairs were reserved for Temple president Richard Englert, City Council President Darrell L. Clarke, and Temple board chairman Patrick O’Connor but none attended Thursday’s community meeting. Clarke, who has said he will only support a stadium proposal that the community backs, also did not attend Tuesday's meeting. Council support will be necessary for the plan. Clarke "will only consider Temple's stadium proposal if they are able to convince residents that it will be to the neighborhood's benefit," spokeswoman Jane Roh said Tuesday. "We have no indication to date that support is building for the stadium, and coverage of last week's meeting appears to bear that out." Tuesday night's brief meeting was held during spring break, while many students were away. Administrators said they have been meeting separately with student groups, including the student government, which has said it won't support a stadium that negatively impacts North Philadelphia. Temple's faculty senate voted by 24-1 to oppose the stadium last month. As a group chanted at the base of the stage Tuesday night, Greg Bonaparte, 61, tried to make the case to protesters for considering the stadium. Bonaparte grew up in North Philadelphia, works in maintenance at the university and said he supports a facility that the community can benefit from. "It's worth hearing the positives," Bonaparte said. "I look around at the disruption, the disrespect tonight, you've got a lot of young people here who are putting up valuable points but not in the right fashion. I don't think the meat of the crowd here tonight is who we need to be talking to." Denise Ripley watched the exchange from the back of the room. The North Philadelphia resident said she opposes the stadium but was hoping to learn more. "It is an overwhelming situation, people are losing their homes, losing whole neighborhoods, that's a suffering thing. I've been through that, but I tell you what, I still wanted to hear what they had to say. How you going to plan your defense if you don't?"